The Islanders were ballsy enough to sport their long-hated fisherman jerseys as practice suits prior to the game against Florida on February 3. That was intense enough for a radical throwback to one of the most daunting and demoralizing eras in Islanders history. How about the thought of turning NHL jerseys into soccer kits? For the true blue American sports fan, you’re probably thinking to yourself, really? There are plenty on the soccer, or football, bandwagon. The overexposure of the Barclays Premier League, thanks to broadcasting deals with NBC Sports, has revolutionized marketing of the game. You can pencil in soccer next to hockey and basketball for many fans, and for some, maybe even higher on their lists than baseball and football. 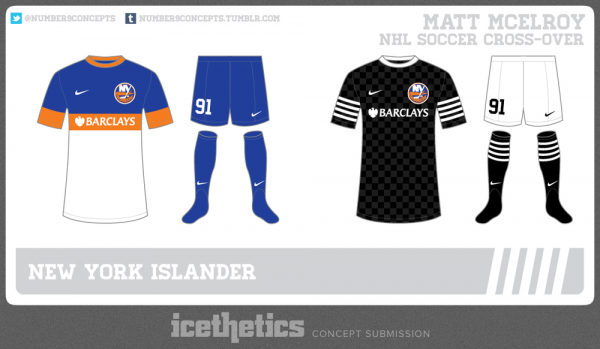 Graphic artist Matt McElroy came up with the hockey soccer kit designs for his Number9Concepts Tumblr site. The forward thinkers at Icethetics, a hockey jersey blog that has been recreating uniforms and blogging about the aesthetics and simplicities of the game’s attire since 2007, first posted about the designs, which were eventually picked up by TSN and other media outlets. Open your mind a bit on this one. Obviously these would never be worn on the ice, but they could sell as a novelty item, or even be worn by players during off-ice workouts. There are countless players who kick around a soccer ball to get loose, or throw around an actual football. McElroy knows his hockey and was on point enough to include both the original orange and blue coloring and the newer black scheme that has been linked to Barclays. The use of Barclays as the main sponsor makes sense considering the franchise’s impending western movement this summer. If teams are ever looking for a boost in revenue for catchy items, this might just do the job.